Core Drill Rental – Core Cut – M4 Complete Combination Core Rig, is available for rent in Rochester NY, Ithaca NY and the entire Western New York region from the Duke Company. 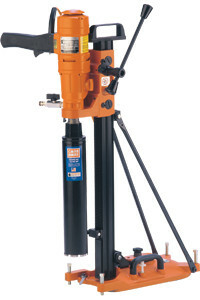 The rental M-4 combination core rig with vacuum available for rent, features a reversible side handle, 1 5/8 inch x 2 inch aluminum column, leveling bolts and hand-held option. This core drill is light weight, portable and ideal for basic contractor and plumber jobs. The vacuum pump enables quick mounting to flat surfaces without drilling.